Age related macular degeneration is a leading cause of vision loss for people over 50. 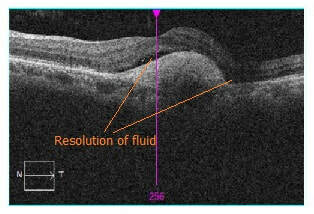 It happens when the macula becomes damaged causing your central vision to become blurred and possible have blank spots in your vision. Unfortunately, macular degeneration tends to run in the family so if you have a family member with macular degeneration, it is important that you get checked yearly. There are two types of macular degeneration. 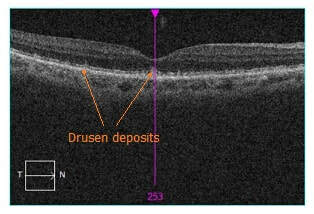 Everyone starts off with dry macular degeneration which is when there are yellow deposits called drusen in the macula. For some people, they will progress to wet macular degeneration which is when abnormal blood vessels grow in the back of the eye. These abnormal blood vessels leak fluid and can cause permanent scarring in the macula, leading to vision loss. There is no treatment for dry macular degeneration but there are things that can limit its progression. Quitting smoking is the best thing for your eyes if you have macular degeneration. Keeping your blood pressure under control and eating green leafy vegetables are also good for macular degeneration. If your dry macular degeneration is advanced enough, your doctor may recommend special vitamins that reduce the chance of progressing to the wet type macular degeneration. Finally, it is important to monitor your vision with an Amsler Grid, a grid that helps detect progression to wet macular degeneration. Fortunately, there are treatment options for wet macular degeneration. If you have wet macular degeneration, injections of a special medicine called anti-vegf can cause the abnormal blood vessels to regress. Most people will need to have these injections every 4-8 weeks. In addition, laser treatment is an option for people who do not respond to injection treatments. Here at San Bernardino Eye Specialists, we diagnose and treat patients with macular degeneration. We perform anti-vegf injections using Avastin, Lucentis, or Eylea. 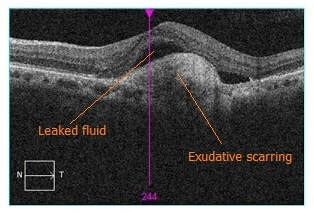 Below is the scan of an actual patient at San Bernardino Eye Specialists that we treated with Eylea.